Applications: Warehouse/distribution environments where you are picking items for fulfillment. Order pickers are great to use in narrow aisle and very narrow aisle applications. The Big Joe J2 Joey is a terrific option for low and mid level order picking. With lift heights up to 144″, the J2 Joey can carry a load up to 2000#. Used to pick individual loads from rack and shelving, this order picker has a 180 degree articulating driveline, resulting in a minimum turning radius, perfect for use in very narrow aisle applications. The Big Joe J2 Joey order picker is an economical purchase. Typically priced well into the $30,000 + range, while the J2 Joey is priced well under $30,000. When your application calls for single item picking, the J2 Joey is always the right choice! Safety was top of mind when the J2 Joey order picker was manufactured. With regenerative braking, a red flashing warning light, and fingertip control built into the retractable vehicle guardrails, safety is a priority on the J2 Joey. The J2 Joey order picker is extremely easy to operate. With a digital dash with battery discharge indicator, hour meter, directional indicator and operator speed, the operator always knows what’s happening. Add in the ergonomic flip down arm rest, fingertip lift/lower buttons and 360 degree tiller steering control, the J2 Joey makes this order picker easy to operate. What application do I use the J2 Joey order picker in? The Big Joe J2 Joey order picker is a great option when picking individual items from a pallet in a distribution environment. 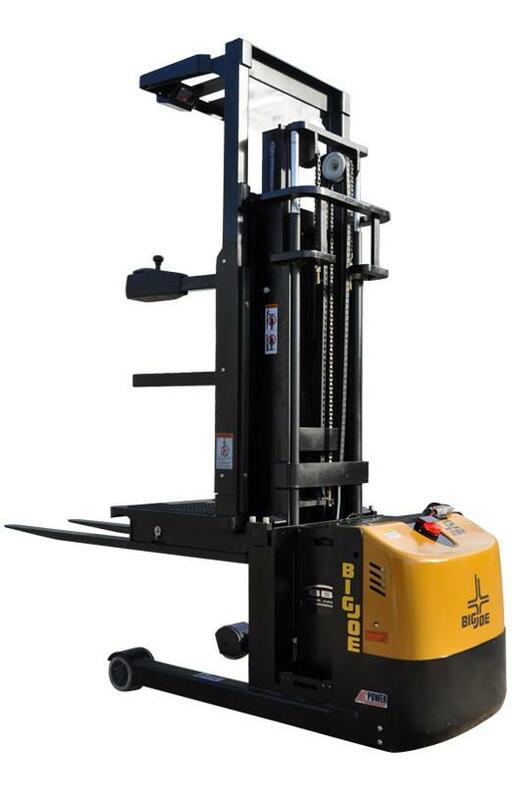 With a narrow footprint that is able to operate in very narrow aisles, the J2 Joey can handle the needs of a distribution application that needs a reliable order picker for heights up to 144″. The Big Joe J2 Joey is an ideal option for order picking in a congested warehouse. With a small footprint and width, the J2 Joey can navigate congested areas in order to get the item your application needs in a warehouse. When picking individual items is necessary, you can rely on the J2 Joey to get the job done. Please fill out the contact form below for more information. A Sunbelt employee will be in touch shortly! © Copyright 2019 Sunbelt Material Handling. All rights reserved. Serving Dallas - Fort Worth and Albuquerque - Santa Fe areas.